Google’s project to digitize five of the world’s greatest libraries will dramatically extend their search engine reach in the future. Current search-engine philosophy, which asserts that ”any search starts with a question to be answered,” will need to be advanced in terms of Peirce’s philosophy: ”Any inquiry begins by creating an hypothesis to be tested, or with abduction.” As conceptual structures researchers prepare to meet access challenges in the world of large Internet knowledge stores, they have a solid foundation in Peirce’s theorized stages of inquiry: abduction, deduction, and induction. 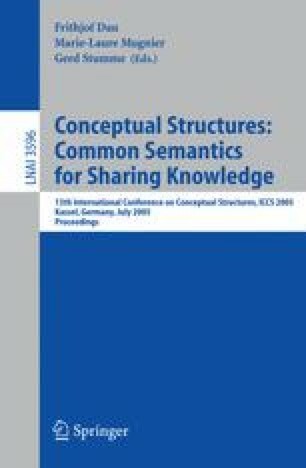 To indicate how conceptual structures tools must augment collaborative, Internet-based inquiry, we imagine a future scenario in the context of a user-centered testbed, where Peirce scholars apply Peirce’s pragmatic theory in their complex manuscript reconstruction work. We suggest that games of inquiry can be developed to formalize user collaboration and technology needs, for improved specification of tool requirements in the testbed context.